I only got to know of Naughty Dog from the Uncharted series. Through this book, I found out that they have actually been in the video game industry for 30 years already. 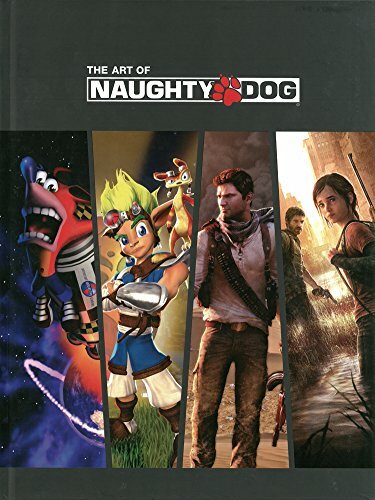 The Art of Naughty Dog is a nice retrospective artbook that tracks the evolution of the studio. They were founded in 1984 as Jam Software before being renamed to Naughty Dog in 1989. This 184-page hardcover is filled with the concept art of the games that were published over the years. Many are previously unpublished artworks, the character and environment designs, for their early games, e.g. Crash Bandicoot and Jax and Daxter. And then there are the artworks for the extremely popular Uncharted series and The Last of Us. The book starts with the early years from 1984 to 1996 recollecting how the company was started by Andrew Gavin and Jason Rubin. Both founders wrote about their experiences in game making, their ideology and eventual departure from the company. When they first started out, they were just creating games for Apple II. The next chapter looks at the Crash Bandicoot years from 1996-1999. In this franchise, there are Crash Bandicoot 1, 2, 3 and Crash Team Racing. I've played the racing game before but did not know that it was created by Naughty Dog. Not only that, there were three Crash Bandicoot games before. I never knew where Crash came from but now it's quite cool to see his other iterations. After Crash Bandicoot, Naughty Dog moved on to Jax and Daxter from 2001-2005. You can see the evolution from the cartoony characters to more mature character-driven games. There are lots of wonderful character designs included. From 2007 to present day, we have the Uncharted series and The Last of Us. There are only 54 pages so they are not as complete as their dedicated artbooks, namely The Art of Uncharted 2 and The Art of The Last of Us. To me, Naughty Dog's best artworks come from these games, and they will tempt you to get the other artbooks if you haven't. The studios' emphasis on lush environments actually had its origins from the Crash Bandicoot days. The next chapter collects artworks from undeveloped projects, one was for Jak 4 and the other an untitled sci-fi game. Then there are a six pages of teasing environment art from Uncharted 4. The last chapter features fan art and some are really quite good, especially the full page and double page splash art. It's great to see how fans interpret the games in their own styles. The downside of the book? I was expecting a bit more writeup for the games. Each franchise only had two pages of text. There are lots of captions for all images provided though. Maybe I was expecting too much but hey, this is a 30-year old company, so there should be many things to write about. As a new Naughty Dog fan, I found it interesting to read about the history and see for the first time their early artworks before Uncharted came out. All in all, this is definitely a good book for Naughty Dog fans. The art is great. However, if you don't care for Crash Bandicoot or Jax and Daxter, you would be better off getting the dedicated artbooks for Uncharted and The Last of Us. The Art of the Uncharted Trilogy is coming in 2015 and will have 240 pages, so I'm expecting a lot of duplicated art.